People want automated testing. 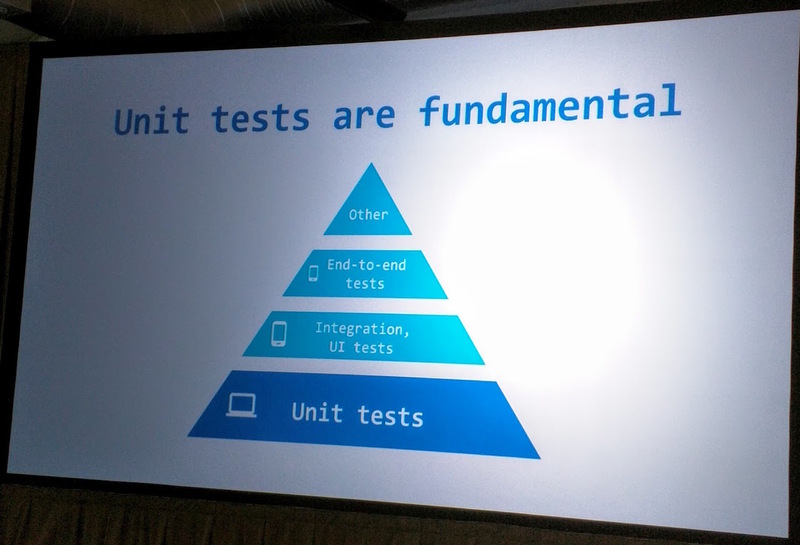 Android has not provided a ton of testing APIs, and it hasn’t evolved much since API level 3. Until recently. 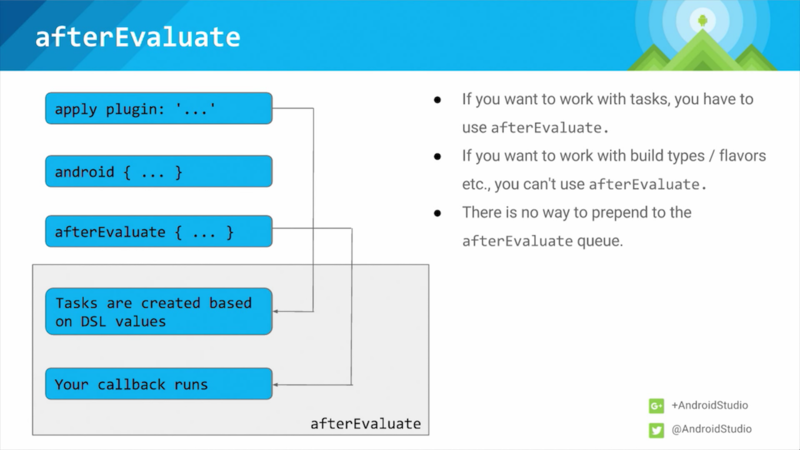 Refactor across unit and instrumentation tests. Unit tests are fundamental. Run locally, generally fast, should be small and well contained. Focused on methods. Don’t put everything into Activities, it makes it really hard to test. 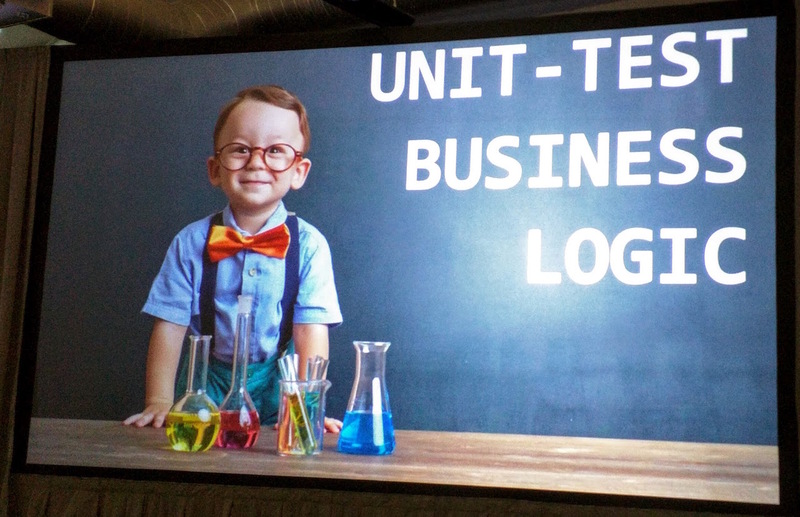 Move business logic out, so that it is more testable. Android Studio helps with Test-Driven-Development. If everything is set up correctly, AS can even help with new features, if tests are defined first. Integration and UI tests check your application through its interface. You need a device or emulator for this. CloutTest Lab allows you to test on real devices. UI testing is hard! Espresso helps with this. Tried to ask: What would a user do? Lots of stuff. Started out simple, but it’s grown. There are multiple support libs, providing different utilities. They’re a bridge for getting newer functionality on older API level devices. Allows you to define layout elements as percentages of the parent. Library major version number is the minimum compile sdk version. E.g. lib v23.1.0 needs compileSdkVersion 23. Dex limit, all of the compat libs add up to a third of the dex size. 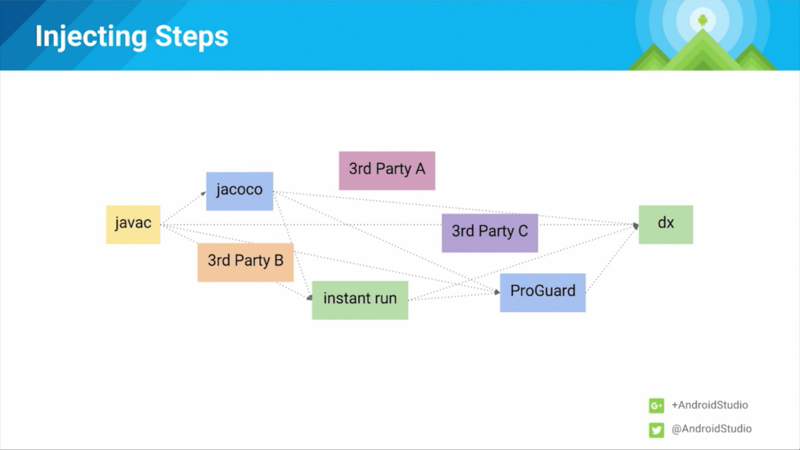 Using proguard: minifyEnabled true, you can cut it down to something more manageable. 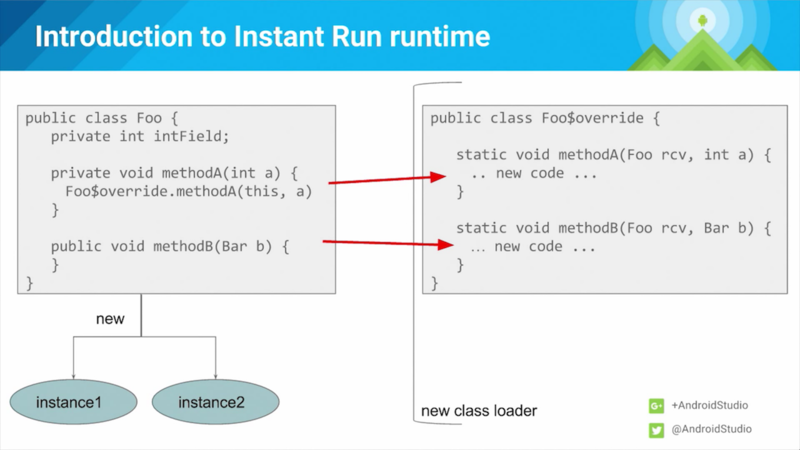 With new AS tools, no need to re-run proguard on every iteration. Using a variable can help to keep all the support dependencies at the same, correct, version in the build.gradle file. This is the sixth post in a series about sharing information between apps. (Series Table of Contents.) In this post, I’m going to discuss some of the feedback that I’ve received so far on this topic. No code this time, but it’s an important part of the discussion, and is going to set the stage for the next few installments. 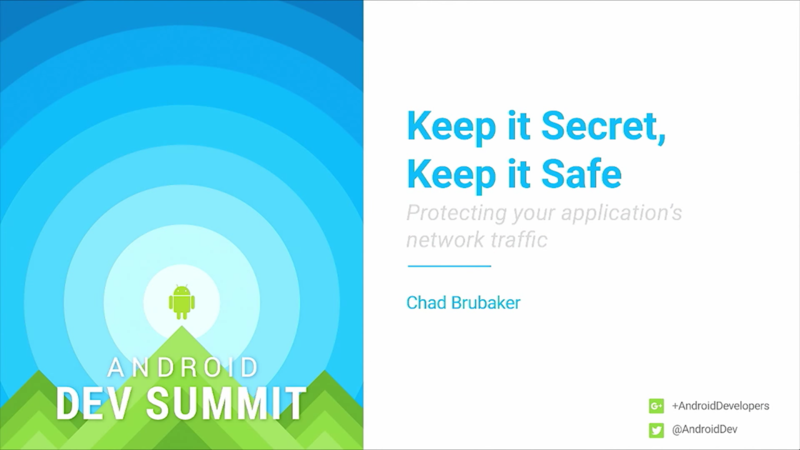 Recently, I gave a talk at Silicon Valley’s GDG DevFest on this series. The talk went fairly well, and I received a good amount of feedback, which was exactly what I was looking for out of the talk. By the way, I’ve been using Chiu-Ki’s notes in several of my recent blog posts because they’re really helpful. Make sure to follow her on Twitter or G+! There were a number of great questions that I didn’t have great answers for. I thought that it would make sense to post them, and think about where to go from here. I’ll also try to categorize them, to make them easier to read together. Q: Rooted phones allow for apps to snoop on the Intents being passed around. How do we secure this? 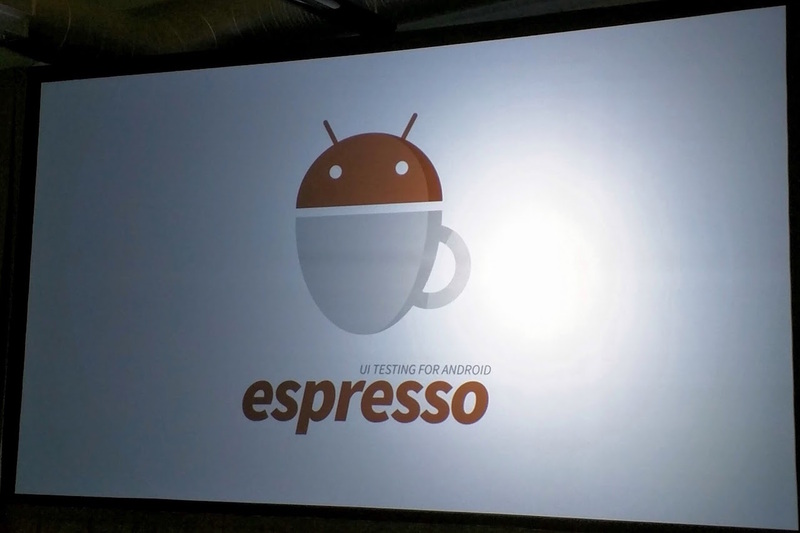 There were a few Android GDEs in the room that chimed in and helped answer some of these questions. They pointed out, for example that on rooted phones, you really have no expectation of security. Q: Locking down Intent filters to just one app? 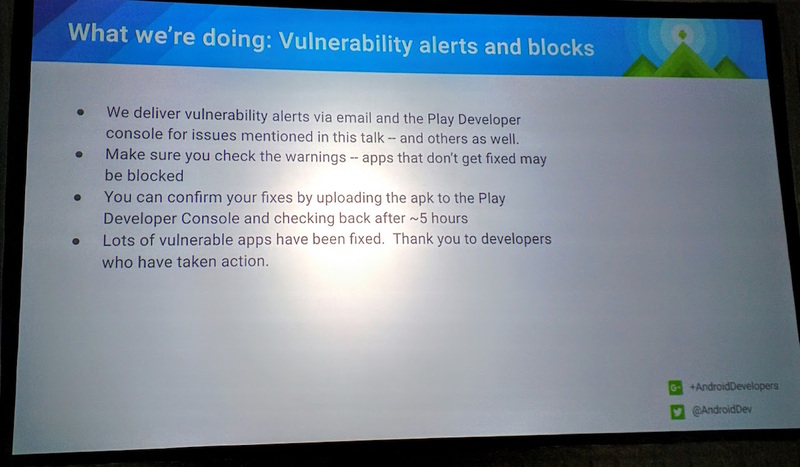 Ryan Harter mentioned that you can lock down intent filters using signature checking, so that only apps signed with your signature are allowed to send and consume them. However, for that case, it’s not really a public API. Q: How do I know that no other app is going to intercept an Intent? I.e. if another app starts listening for the exact same Intent, and the information is sensitive, that could be an issue. I do think that this question deserves a better explanation. I have ‘security’ and ‘a deep dive on Intents’ on my roadmap for this series. So, my current answer is that I’ll try to cover those issues in a future post. 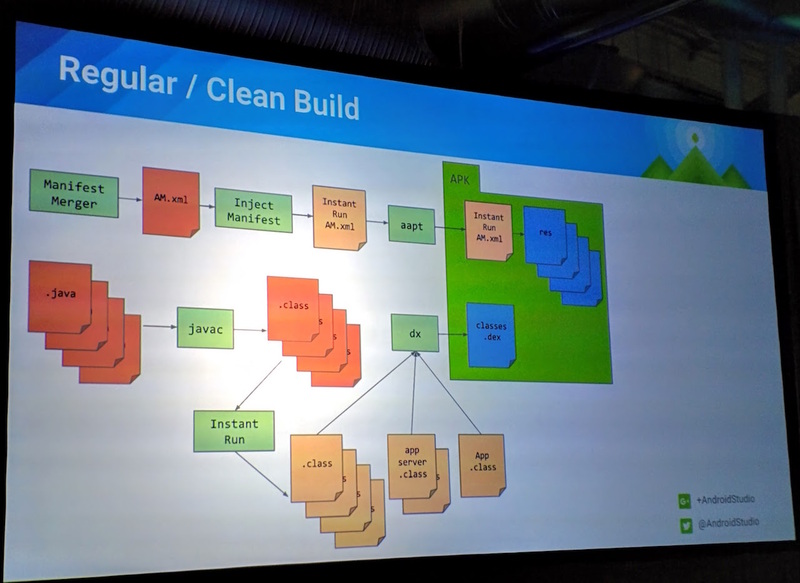 Q: Wouldn’t it be more scalable to do this on the backend? In terms of sharing data with multiple platforms. If iOS needs the same integrations, and does them on the backend, providing a second set of APIs is lots more work. As far as the scalability question goes, my immediate answer was that the authentication may be able to be done locally. I’m pretty sure that there are accounts APIs for this, and it may be necessary to open an additional in-app API for getting full auth details for the backend web requests. The point is that on-device public APIs may not be the answer to all inter-app communications issues, but they should at least be part of the conversation. 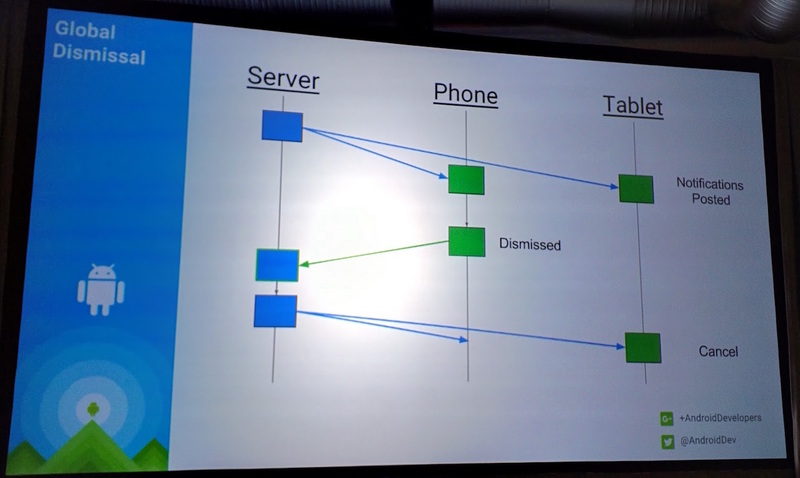 Android GDE Mike Wolfson also mentioned that using a local public APIs can really help with reducing network usage. Q: In the case where lots of developers open up APIs, how do other apps discover them? The question around service discovery and consistent behavior may be able to be addressed by some sort of central repository of APIs. Such a repository may contain highly structured data around how to make requests to any given API, which apps provide such functionality. Q: What happens when multiple apps provide the same Intent API, but don’t work the same? This is why we chose Aviary to use with Talkray, over going with whatever was already on the device. Such a repository/project should also provide some sort of automated testing to attempt to validate that the functionality works consistently between apps claiming to provide similar features. I have a feeling that once I finish laying the groundwork (and assuming that I’m not completely bored with this topic), that this is where I’ll be spending a lot of my time. I think that the monetization question was interesting, and I’ll certainly cover that in a future post in this series. I don’t think that it needs to be difficult, but I do think that it requires some thought around doing it in a way that maximizes benefit to you, your users, and your partners (those consuming your API). I’ll be circling back to what’s been brought up here in future posts. Stay tuned! Consider having a development flavor using min SDK 21, as it’s going to be faster. Use a separate project just for the test APK. Test code then lives in the main source set of your test project. One note on all of this is to make sure that you avoid build tools and dependency version conflicts! 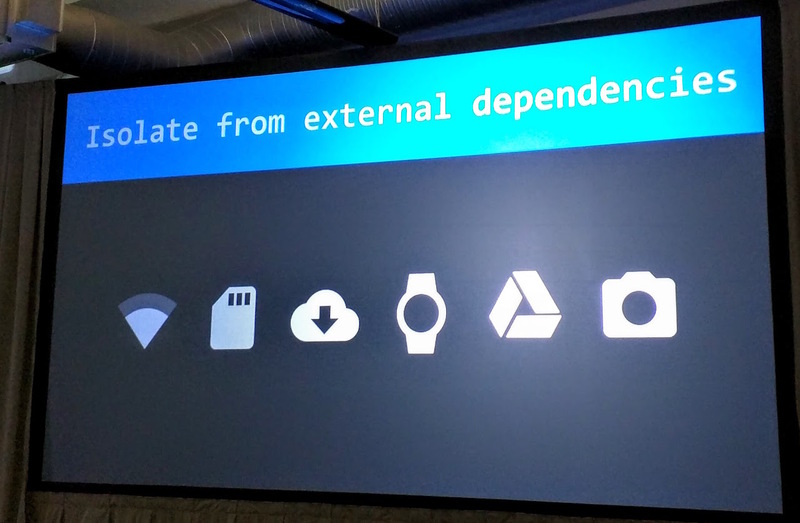 Main APK and Test APK need to have the same Build Tools version, and same versions for dependencies. This should be common sense (since you want to test the same versions of everything). The correct way to extend the Gradle Android plugin. Note the .all, that’s important! Public and private task APIs may be broken. They’re trying to get better about it. Problem: inject tasks between javac and dx. Support different scopes: Project, sub-projects, etc. 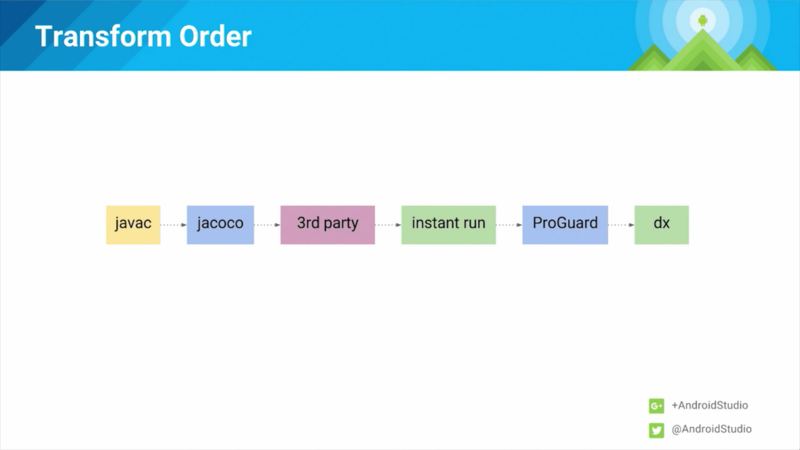 The Transform API uses a fixed order, to reduce bugs. Only compiles, dex’s, and delivers .class that has changed. 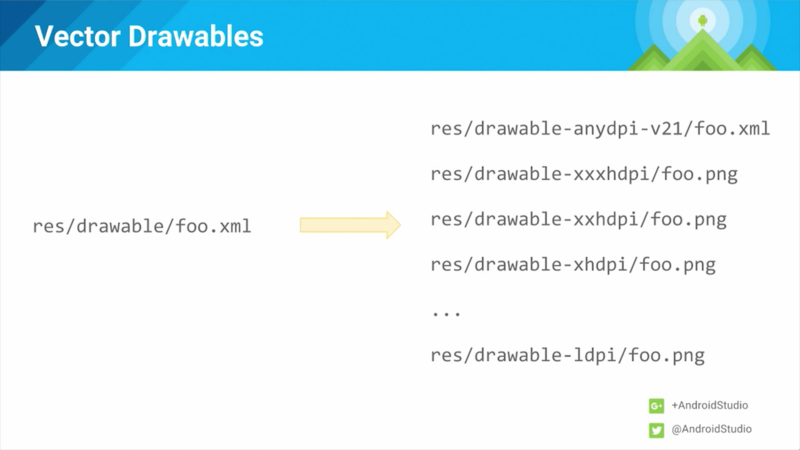 You can use Gradle extensions to create shared properties. The dependencies block is a top-level attribute in the current version. Even if you add dependencies only within specific flavors of your app, they will be added to all flavors. Instead, if you prepend the product flavor to the compile command in the dependencies block, you can restrict it that way. Vector in res/drawable/vector.xml (or xml), it will automatically generate all flavors. Generated flavors and densities can be configured in the build.gradle file. Officially supported in API 21, density specific pngs generated for older devices. Per flavor setting. org.gradle.jvmargs=-Xmx4096m to change allocated memory for gradle. Coming in preview 2 (hopefully). Currently, only density is supported. Only package one set of assets (e.g. mdpi only). Install time for IO Schedule (5MB) on N6 was 12 seconds. Create Instant Run specific tasks. Need to turn things on in the Instant Run prefs. Data binding is broken in the preview build, working in nightlies. 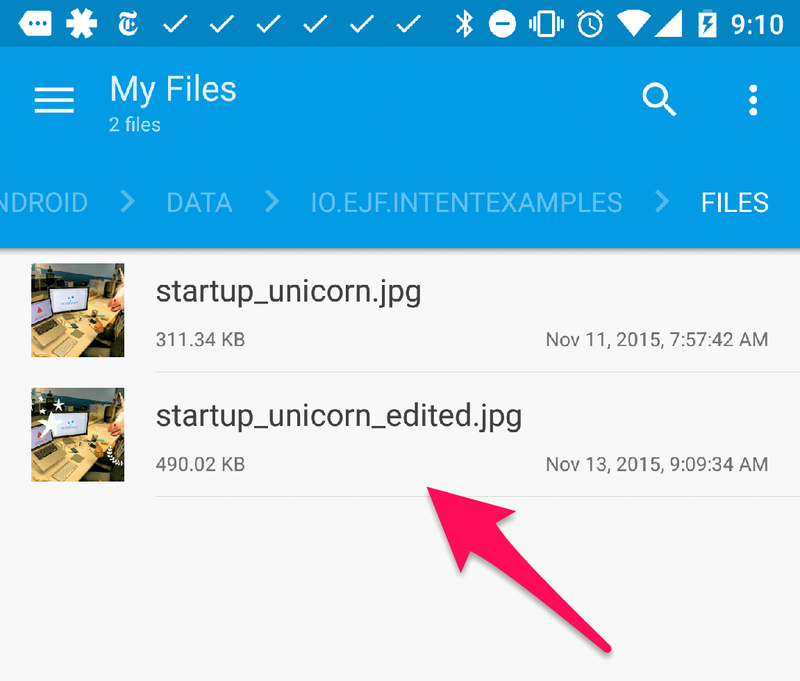 This is the fifth post in a series about sharing information between apps. (Series Table of Contents.) 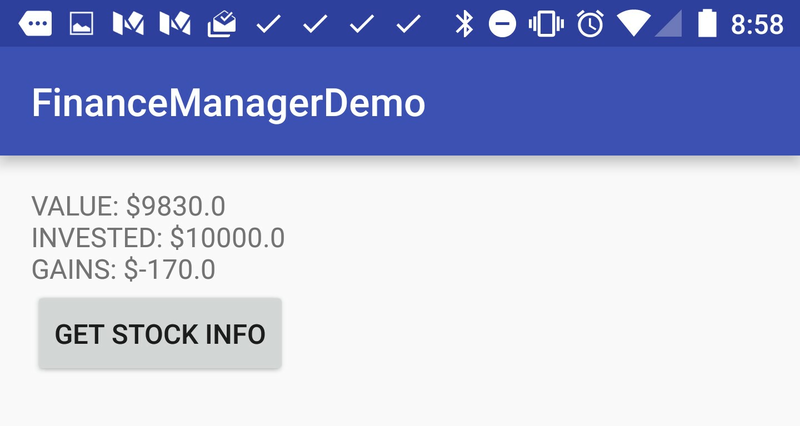 In this post, we’re going to create another demo of an Intents based API. Let’s imagine a scenario, Mohammed has built an investing app. It allows users to buy stocks and build up a portfolio. His app is only available on smartphones. There’s no web version of the app, and no public-facing APIs available from our servers. Now, let’s imagine that his friend Susan is building an Android app to help people manage their finances. She wants to give her users the most complete picture that she can. She already has bank and credit card integrations done, and now she’s looking to build a view of users’ investments. She knows that a lot of her customers are also customers of ours. She asks Mohammed if he can open up an API for her. All she really needs is a current dollar value of the investments, along with the amount of cash invested. Mohammed decides that he can open up an intent API for her in our app. 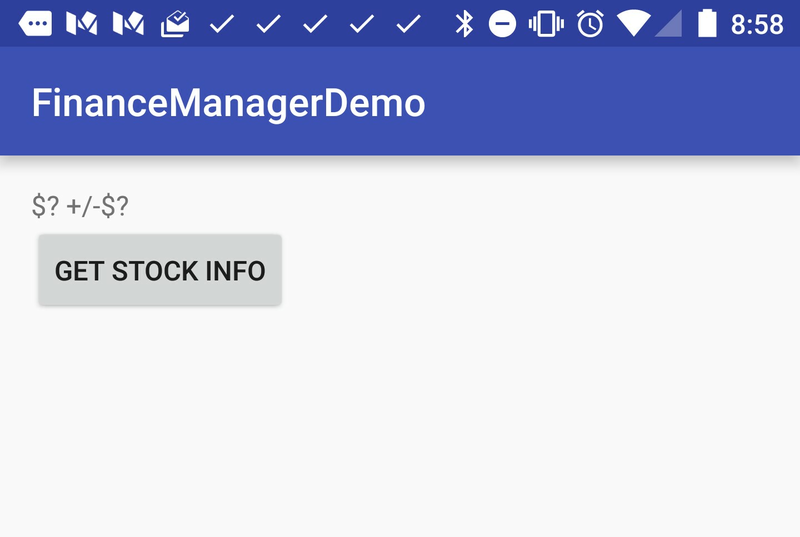 For demo purposes, I’m not actually going to build out a stock app, I’m just going to build something that handles the Intent request, and returns a response. Disclaimer: Please do not actually do this with a financial app unless you consult with a security expert first. I would assume that this could be made to be safe, but I am not a security expert. The point is that there are ways of adding layers of security. 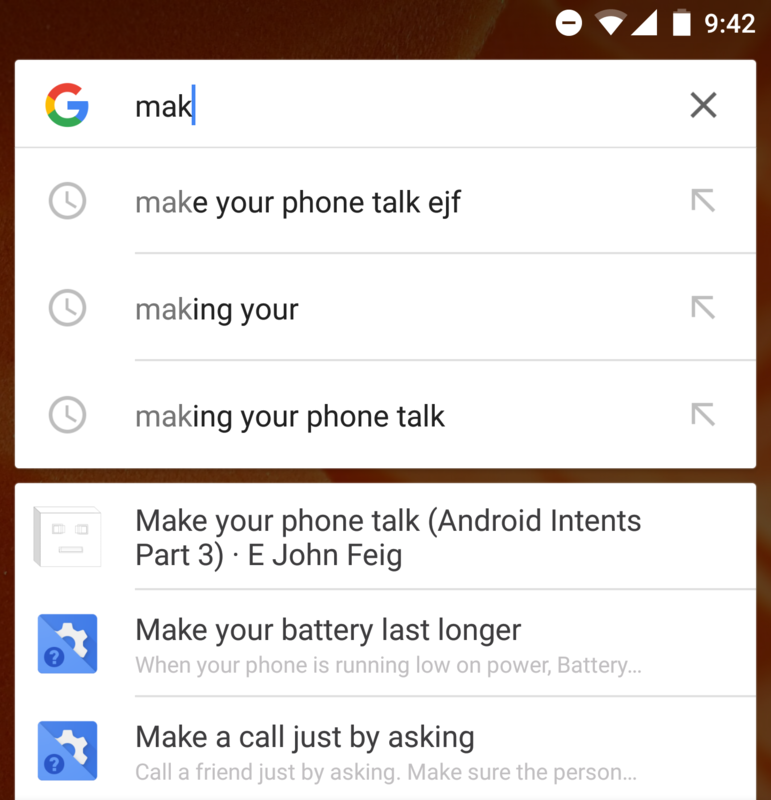 Today, we looked at another example of using public APIs on the phone. We thought through a new example of something that might be useful to do, and built a demo of that. I have some ideas for the next few posts, but I don’t want to spoil the surprise (which is to say, I have no idea how I’m going to write up the next few posts). Keep an eye on the Table of Contents for the latest entries in the series.